Most researchers believe that Olde Robert Selfe was the ancestor of most of the Self family in America. 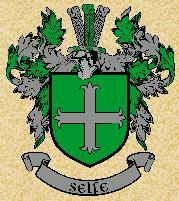 Arriving in Virginia in the 1600s, Robert Selfe appears to have been descended from Walter Selfe of Cripplegate, London, England. The name "Self" is thought to be a shortened version of "Seawolf," dating back to the early Viking voyages along the English coast. Many courageous Selfs became pioneers in our country's expansion westward, and the descendants of Robert Selfe were soon residents of the Southeastern United States from Virginia to Texas with several families settling in the midwest. Today, the Self name can be found in all fifty states. Who was Walter Selfe? Read the article at "Self Seekers," January 1999, and search there for other information on Selfe history in England. DO WE HAVE YOUR CORRECT E-MAIL ADDRESS? Tim is the grandson of Homer Self, the little boy seated at the extreme right of the photograph on our "Family Album" welcome page. He lives in Southern California, and in addition to genealogical research, he's interested in computers, guns, and restoring old trucks. He's added six children, even more grandchildren, and two great-grandsons to his own Self portrait. Barbara was a computer network administrator in a Southern California community college library, retired as of June 2010. She's been involved in family research since the age of 14 in New England. We enjoy corresponding with all of the "cousins" who discover Self Portraits. Don't forget to check our LOST COUSINS pages if you didn't get an annual greeting this year. Have you changed your e-mail address lately? Please let us know so we can correct our files. Click HERE for information on the exciting new SELF DNA project! Our Website, SelfSite at RootsWeb is an extension of Self Portraits. SelfSite at RootsWeb is dedicated to facts. Here you'll find our Census Tables as well as State by State/County by County families that make up our "Loose Ends" and "Dead Ends." Both projects are always in progress, so please check the site regularly. And if you would like to contribute Census records, please contact us. Subscribe to our Self Surname mailing list!! Send an e-mail message to SELF-L-request@rootsweb.com (or, if you prefer "digest" form instead of individual messages, send the message to SELF-D-request@rootsweb.com). Please post your contributions directly to the RootsWeb-hosted Board. You may wish to place queries on both the Message Board and this Website. If you'd like to post a query to help you find an ancestor, visit one of our Find YourSelf pages and then contact Webmaster with your request. to our Link YourSelf page. Check out the featured family! FAMILY RECORD UNTIL THE REVISIONS ARE COMPLETE. A list of past families can be found on the Featured Family List page. If you have a gedcom or other electronic file that you would be willing to distribute to other cousins, please let us know. Can you identify the people on our SELF MYSTERY PAGE? Click here to listen to 1848 Music Box --c1996 by Tim Seawolf-Self and Barbara Peck--while you're climbing your family tree. Click here to visit the Home Page of our Internet provider, Mediacom. If you've visited this site recently, please reload or refresh your browser. If you would like "Self Portraits: The Self Family Netletter" to start up when you first activate your Browser, follow your Browser's instructions to make us your Home Page!